The Dossier page in Content Station is used for managing the content of a Dossier and for publishing that content to one or more Publication Channels. Dossiers can display different types of content, as shown in the figures below. Figure. 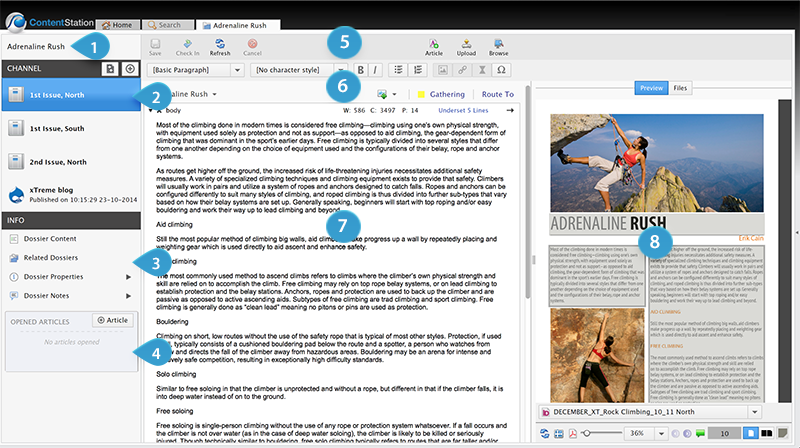 A Dossier page with the main working area showing a Publish Form 1. Dossier name 2. Publication Channel pane 3. Info pane 4. Opened articles pane 5. Toolbar 6. Publish Form pane. Info: This feature requires Content Station 9.5.0 or higher with Enterprise Server 9.4.0 or higher. Figure. A Dossier page with the main working area showing the content of a print Publication Channel (channels of type Adobe DPS are displayed in the same way): 1. Dossier name 2. Publication Channel pane 3. Info pane 4. Opened articles pane 5. Dossier toolbar 6. Article toolbar. 7. Assigned articles 8. Preview pane. Note: In Content Station versions 9.0 – 9.4, this is also the way the content of a Publication Channel of type 'print' or 'Adobe DPS' is displayed. Figure. 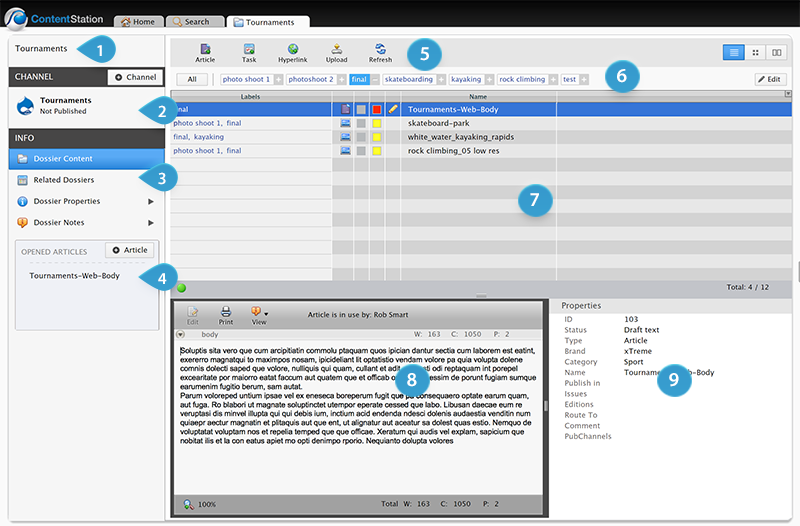 A Dossier page with the main working area showing the Dossier content, Preview pane and Properties pane. 1. Dossier name 2. Publication Channel pane 3. Info pane 4. Opened articles pane 5. Toolbar 6. Dossier Labels bar. 7. Document pane 8. Preview pane 9. Properties pane. The Publication Channel pane shows the Publication Channels to which the Dossier is assigned. As a Publish Form (for Publication Channels that make use of Publish Forms, such as those that publish to a Drupal-based Web site). (Content Station 9.5 and higher) For Publication Channels of type Print or Adobe DPS: by showing the articles that have been assigned to the Publication Channel, together with a layout preview. (Content Station version 9.0 – 9.4) As content in a Document pane (for Publication Channels that do not make use of Publish Forms, such as print, Adobe DPS, and Drupal 6 based Web sites.) This Document pane only shows the content for the chosen Publication Channel (note the difference with the Dossier Content option (see Info pane below), which shows all files that are added to the Dossier). Dossier content. For viewing all files that are added to the Dossier. (note the difference with selecting a Publication Channel (see the Publication Channel pane above), which only shows those files that are assigned to the Publication Channel). Displayed are the Document pane, Preview pane and Properties pane. Related Dossiers. For viewing the Dossiers that are related to this Dossier. Displayed are the Document pane, Preview pane and Properties pane. Dossier properties. For viewing the properties of the Dossier. Dossier Notes. For viewing the Dossier Notes pane, used for viewing and/or adding a note to the Dossier. Each time you open an article from the Document pane or from a Related Dossier, it is added to the Opened Articles list. When switching to a different view (for example by clicking a Publication Channel in the Publication Channel pane), you can quickly return to an article by clicking it in this list. Appears when selecting a Publication Channel that makes use of Publish Forms, such as one that publishes to a Drupal-based Web site. Articles pane, showing the content of all articles that are assigned to the Publication Channel. Preview pane, showing the layout on which the articles are placed. Files pane, showing the files that have been assigned to the Publication Channel. With the Dossier Content option in the Info pane selected: all files that are in the Dossier for all Publication Channels. With the Related Dossiers option in the Info pane selected: all Dossiers that are related to the current Dossier. (Content Station version 9.0 – 9.4) With a Publication Channel selected which does not make use of Publish Forms (such as print, Adobe DPS, and Drupal-based Web sites): all files that are in the Dossier and which have been assigned to the selected Publication Channel. Shows a preview of a file when the file is selected in the Document pane. Shows the properties of a file when the file is selected in the Document pane. View the following video for an overview of how to use the Dossier page.